Space, a seemingly vast frontier, is actually pretty crowdedwith junk, and it's getting worse. Just this week the communications satellite Galaxy15 lost control and joined the growing ranks of debris crowding the spacearound Earth. There are about 500,000 pieces of spacejunk ? down to items about 0.5 inches (1.27 centimeters) wide ? in orbit. Of those, about 21,000 objects are larger than 4 inches (10.1 cm) indiameter, and are being constantly tracked by the Department of Defense's U.S. Space SurveillanceNetwork. These are items like spent rocket stages and broken satellites suchas Galaxy 15. Space junk ? even tiny pieces of it ? is dangerous becauseobjects orbiting around Earth travel at speeds of about 17,500 mph (28,200 kph). At those velocities, any collision between twoobjects would cause serious damage. However, this one new addition to the problem doesn'tsignificantly increase the amount of space debris or the risk of a crash, saidNicholas Johnson, Chief Scientist for Orbital Debris at NASA's Johnson SpaceCenter in Houston. A major collision occurred last year, when the dead RussianCosmos 2251 spacecraft accidentally slammed intothe Iridium communications satellite over Siberia at an altitude of 490miles (790 km). The collision broke up both craft into many tiny pieces. 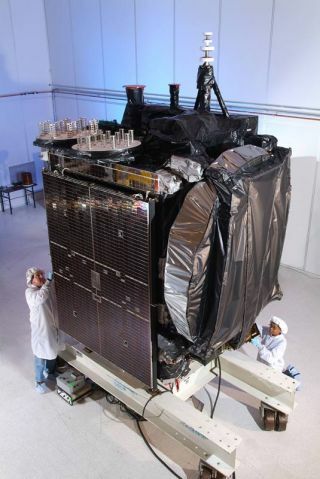 Another major event occurred in 2007 when Chinaintentionally destroyed a weather satellite about 528 miles (850kilometers) above Earth, creating a massive cloud of flotsam in orbit. "Those two events combined have increased the number ofobjects in low-Earth orbit that we track by over 60 percent," Johnson toldLife's Little Mysteries, a SPACE.com partner. "And that's compared toeverything which had accumulated over the past 50 years. These were dramatic,unprecedented increases." Today, the highest concentrations of debris in space are atthe respective altitudes of these two collisions, Johnson said. Such crashes, and their ensuing additions to the swarm ofjunk in space, will only become more common as space gets even more crowded.